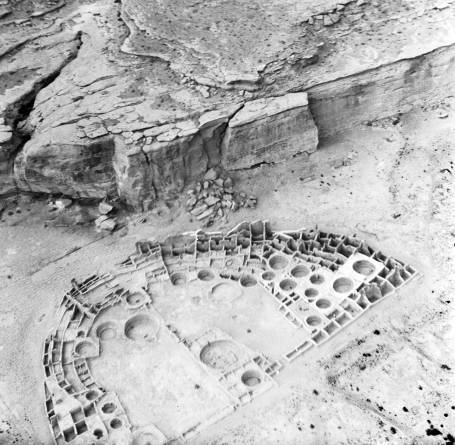 Above: A 1929 aerial image of what’s now known as Chaco Culture National Historical Park. Photo by Palace of the Governors Photo Archives 130232. There is no post office, no filling station or garage, no bank, no barbershop, no newspaper office, no anything else to burden the silent and restful spot with noise or to remind one of the nerve-racking struggle for existence that modern civilization has imposed on the world outside. Shut in by narrow canyon walls, it is a place of almost complete quiet. Rambling through the ruins, one’s imagination, stifled for years, begins to manifest itself. You can feel if not see the spirits of thousands of busy people, softly slipping into the scores of doors and over terraced flat roofs. You stand and dream in the silence of death to be startled and jump nervously when a cottontail leaps from behind a rock and scuttles away through the dry sagebrush.